An SB 1070-style traffic stop, an unattended illness in jail, and one family’s tragedy. Editors’ Note: Read our primer on Supreme Court oral arguments about Arizona’s strict anti-illegal immigration law, and check out our one-of-a-kind database of anti-immigration laws. Plus: See a related photo essay here. David de la Fuente might still be alive if his pal David Salazar hadn’t been short on cash one day. Both men lived in Phoenix, where they’d settled after making their separate ways north from the Mexican farming village of Colonia Emilio Carranza many years earlier. Salazar and his family came across legally in 1974, while de la Fuente arrived during the 1990s, traversing the desert on foot to cross the border illegally near Nogales, Arizona. De la Fuente, a plumber, and Salazar, a delivery driver, eventually became good friends. Their families grew close, too, often spending weekends and holidays together. But that all changed one morning in May 2009, when Salazar asked de la Fuente for a ride to the ATM. They hopped into de la Fuente’s green Nissan Maxima and drove to a nearby Wells Fargo. As they were about to turn into the parking lot, a Phoenix squad car driving behind them hit its flashers. By Salazar’s account, officer Matthew Prutch asked de la Fuente for a driver’s license. When he produced a fake, Prutch had him step out of the car and handcuffed him. Salazar asked the officer whether he’d pulled them over because of their skin color; Prutch, he says, replied that he was just doing his job. (In his report [PDF], Prutch wrote that he ran the Nissan’s plates while following the car and found no driver’s license data associated with the registered owner. “He appeared to be a Hispanic male,” Prutch added, “and under reasonable suspicion I believe [sic] the driver to be driving with no valid license.”) Minutes later, another officer arrived and asked Salazar for his license, even though he hadn’t been at the wheel. Prutch then delivered de la Fuente to the police station for booking. From there, the 35-year-old was taken to Maricopa County Sherriff Joe Arpaio’s notorious Durango Jail, and charged with using a fake ID. A month later, he was dead. Before SB 1070, the Arizona law that allows police officers to detain anyone they suspect might be in the country without papers, there was 287(g). That’s a 1996 amendment to the Immigration and Nationality Act under which the feds can deputize state and local law enforcement to capture and detain undocumented immigrants. 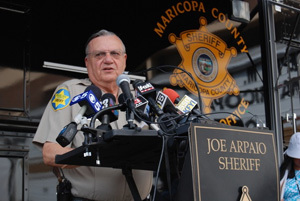 Some 71 agencies in 26 states operate under 287(g) agreements—Arpaio signed up in 2007. It was Arpaio’s zeal that compelled me to spend five months on his home turf last year. I wanted to see firsthand how his tactics affected the Latino residents who make up 31 percent of the county’s population. I heard story after story—from citizens, legal immigrants, and undocumented residents alike—about encounters with deputies and cops determined to play Border Patrol. It got to the point where I raced home in a panic one morning after heading out for a jog without ID—what if a deputy, seeing a Latina running down the street, decided to haul me in? Maurilio (who also feared giving his real name) is a construction worker who has lived in the United States without papers for 21 years, raising two kids who are US citizens. He said his family was camping at a lake over the Fourth of July weekend in 2008, when a fellow camper started yelling something about “too many Mexicans” and called the sheriff’s office. The deputies, Maurilio and his wife told me, threw him down in the presence of his six-year-old son and shoved his face into the ground. They then yanked his head up by his hair and pepper-sprayed him as they cuffed him. After a few weeks at Durango, he was deported—and immediately headed to the desert to walk back north. Alex, a third-generation US citizen, left his parents waiting outside a Circle K—and returned to find Maricopa deputies yelling at them to produce papers. When David de la Fuente arrived at Durango, his friends and family say, deputies immediately began grilling him about his immigration status. One of his sisters visited twice, as did Salazar. Each told me that de la Fuente was deteriorating quickly. The guards, he told them, kept dragging him back and forth between the prison yard (where temperatures reached 107 degrees) and the frigid jail—leaving him queasy and disoriented. He also complained of severe chest pains, but fearing the guards might retaliate, told his family not to press the authorities about his condition. Eventually, de la Fuente was hauled before a judge, who fined him and put him on probation for giving an alias to the police. After three weeks in custody, he was turned over to federal immigration authorities, who delivered him the next day to Nogales, Mexico, about 700 miles north of his hometown. 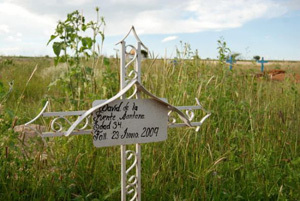 By that time, he was gravely ill.
David de la Fuente’s humble, hand-painted grave marker is adorned with a simple iron cross. Click here to see a photo essay from Aura Bogado’s trip to the de la Fuente family home in Zacatecas, Mexico.He arrived in Colonia Emilio Carranza three days later, stumbling and barely able to speak. His family got him to the hospital, where he was diagnosed with acute pneumonia. Based on the stage of his illness, the doctors determined that de la Fuente had contracted it about 15 days earlier—roughly a week into his jail stay—according to medical paperwork and an interview with the hospital director. The doctors did what they could, but de la Fuente was too far gone. His cousins and a sister stood vigil as he dwindled and eventually fell into a coma. He was pronounced dead on June 23—exactly four weeks after the traffic stop.